Simplicity is Beauty. Good Ole M&M Cookies with a Maple Twist. It has been ages since I have made any type of cookie. I had recently picked up a small pouch of Crispy M&M’s and they have been sitting on my shelf. Well last night inspiration hit and I thought to myself Simplicity is beauty. 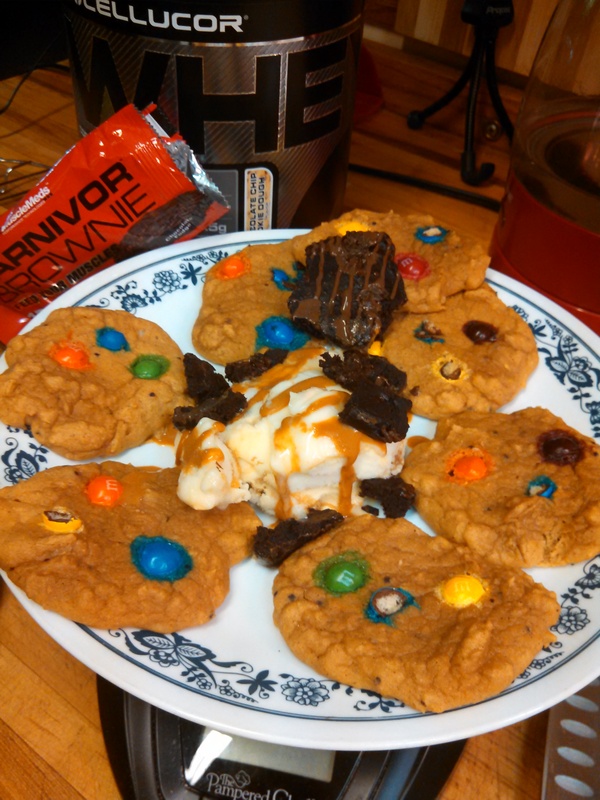 Lets take it back to some basics and do some M&M cookies spiced up with a bit of maple for the down home feeling. Now I didn’t take step by step pictures cause I wasn’t going to post this as a recipe quite yet but hey why not right? First Preheat oven to 350 F.
Then Rinse and drain Beans. Blend or mash them together, add pumpkin, egg whites, vanilla maple syrup, and maple flavoring mix until combined. Add in the Protein, Coconut flour, sweetener, cinnamon. Mix again until well combined. Add in milk, or extra sweetener if needed, I used a bit more syrup and a splash of almond milk. Take batter and place evenly on a sprayed baking sheet, putting down wax or parchment paper if needed. I have this new oven liner thing that works great and don’t even need to spray it. Once all the batter is placed I then added some M&M’s to each cookie. You could mix in the batter as well, I just wanted each cookie to have even amounts of goodies. Pop in the oven for 6-10min. My oven was at 450 right before I put these in so it was very hot, could of shortened by cooking time a bit. Just keep an eye on them. Once done, Pop out of the oven to let cool for at least 15 min. Pair with something like Ice cream or just eat by themselves! These had a nice Cakey texture to them. Macros Per Cookie : 62 Kcal, 1g Fat, 7.1g Carbs, 6g Protein. Not to bad if I say so myself. Macros will drop even more if you were to take out the maple syrup or say waldens farms or something like that, as well as leaving the M&M’s out, but I mean come on…… who wants to do that? remember if you like the outcome let me know ! If you post the recipe I would love to see it!